Sunday morning service teams foster community while enhancing the Sunday morning worship experience. People of all ages have the opportunity to get to know each other and to participate actively in our worship services. Team members volunteer in many ways, including greeting, ushering and assisting with communion. There are ten teams with each team serving every ten weeks. If you are not currently on a team, please consider joining one. It’s a meaningful way to participate in the life of the congregation. If you have questions or would like to join a team, please contact Laura Stein. The purpose of this position is to provide the ministry of hospitality to both members and visitors coming to Good Shepherd for worship or other events. We welcome all with the grace and love of Christ. Welcome Center hosts are often one of the first people someone new to our church may meet. It is important then to come with a positive attitude and provide a smile and warm welcome to all those who walk in our doors. Sign up here! Guild members serve the worship life of the congregation by assisting with the sacrament of communion. Contact Shelley Horstman. Youth and adults support the pastors by leading the prayers of the church and serving communion during worship. Contact Pastor Debra Samuelson. Recruit members to serve as assisting ministers at worship.Contact Pastor Debra Samuelson. Help people attend a worship service. Class C driver's license required. Contact Laura Stein. Work together to prepare and serve meals after funerals and memorials services.Contact June Hestad. Help maintain Good Shepherd's beautiful courtyard garden. Contact Sam Nichols. Team members and volunteers help preserve Good Shepherd’s history and heritage for future generations. Help care for the church kitchen through cleaning, monitoring supplies, etc. Contact Shirley Brandt. 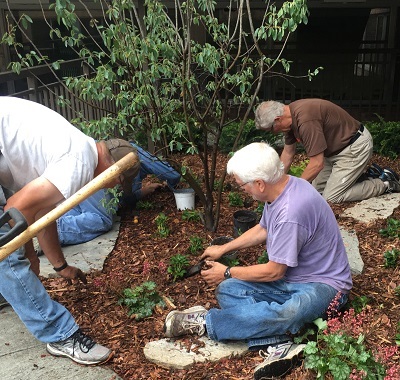 Committee members and other volunteers work to keep our building and grounds in tip-top shape. A holistic system of coordinated body posture and movement, breathing, and meditation used for health and spirituality, Qi Gong is traditionally viewed as a practice to cultivate and balance. Contact Judy Baratta. See how fellowship happens around coffee. Become a Sacred Grounds barista. Learn more. The ministry team responsible for the congregation’s stewardship plans year-round stewardship awareness. Team members and volunteers welcome visitors and guests and help them make connections; provide hospitality for neighborhood outreach events; and encourage the development of fellowship groups and events. New members are always welcome! Contact Andrea Norman. Deliver a gift bag of cookies and a welcome brochure to first-time Sunday visitors. Extend a friendly acknowledgement of their worshiping with us and offer an opportunity for brief conversation. Contact Andrea Norman. Learn about our art collection, set up galleries, organize art catalog, create liturgical art. Contact: Cathy Roinas, Brita Taracks, or Vic Perlbachs. Answer phones, greet visitors and help with general office projects. Contact Laura Stein.